Margaret Tait was a pioneering filmmaker for whom words and images made the world real. In ‘documentary’, she wrote, real things ‘lose their reality and there’s no poetry in that. In poetry, something else happens.’ If film, for Tait, was a poetic medium, her poems are works of craft and observation that are generous and independent in their vision of the world, poems that make seeing happen. Margaret Tait was born and raised on the remote Scottish island of Orkney. She was an intensely private person with a unique vision, firmly rooted in her native land. Margaret was sent to Edinburgh, aged 8 to be educated. After school she studied medicine at the University of Edinburgh. She graduated in 1941 and in 1943, during World War II, joined the Royal Army Medical Corps and served in India, Sri Lanka and Malaya. She returned home to work as a doctor but was not settled to this career, and in 1950 moved to Rome to study filmmaking at the Centro Sperimentale di Cinematografia. Returning to Britain in 1952, she took up locum positions around the UK in order to earn the money which allowed her to produce short films. Despite the difficulties of this nomadic lifestyle, this was a time of great creativity and she wrote many poems in this period. By 1954 Margaret returned to Scotland and rented a studio on Edinburgh’s Rose Street and by late 1960’s she returned to Orkney. Throughout her life Margaret made thirty two short films and one full-length feature, Blue Black Permanent. In addition, she wrote prose and poetry and published three poetry books – origins and elements, The Hen and the Bees, and Subjects and Sequences. 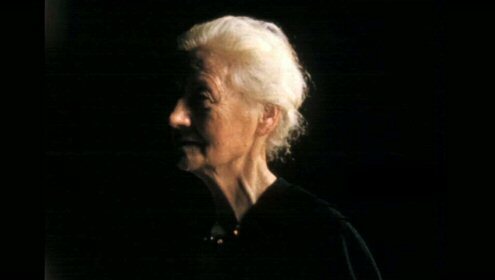 Margaret Tait died April 16th 1999, aged 80. Glasgow Women’s Library, working with filmmakers Marissa Keating and Michael Jones, went on a journey to document the story of this elusive filmmaker and poet through her friends, family, and peers. Join us for the premiere of that work. A short trailer of the documentary was screened at Edinburgh International Film Festival in June 2012, you can watch the trailer below.